Countess is a new dual-purpose cherry-plum. The fruits are large by cherry-plum standards, but a bit smaller than most plums. 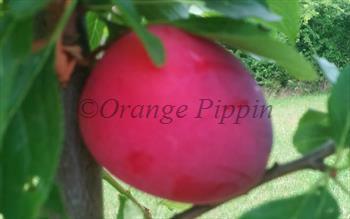 They have a rich and very sweet flavour - and a much better eating quality than most mirabelles and cherry plums. 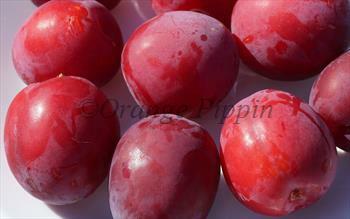 Like other cherry plums and mirabelles, Countess is also good for cooking and preserving. When fully ripe the stone comes away easily from the flesh - it is a freestone. The fruits ripen in July in southern England. 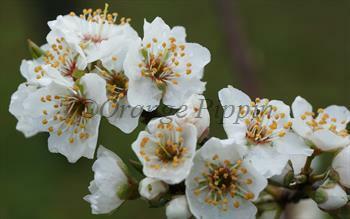 Please fill in the details below and we will let you know when Countess mirabelle trees are back in stock. Countess is in flowering group 1. Countess is partially self-fertile, but fruiting will be improved if there is a compatible tree of a different variety nearby. Countess usually flowers profusely, and as a result is partially self-fertile. Its flowering season is very early, usually February in the south of England. As a result it is a good pollinator for early-flowering cherry-plums, and related plum species such as pluots and Japanese plums. The fruits tend to ripen quite quickly, turning from orange to deep crimson within a few days. Pick them as soon as this starts to happen if you want to cook with them, or leave them for a few more days if you want to eat them fresh. It is difficult to judge the ripeness by touch alone as they remain quite firm even when fully ripe. Countess was developed in the Ukraine. Some authorities classify this variety with the true mirabelles (Prunus insititia) but it is actually a hybrid variety and its flowering and ripening periods make it closer to the cherry plum (Prunus cerasifera).